When it comes to website menus, you want to be sure they provide web site navigation that works for your visitors. If you do not set up effective website navigation, people will quickly leave your site. 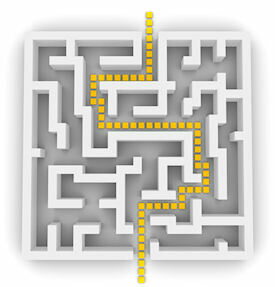 Did you ever get to a site and find it hard to figure out how to navigate? Either the navigation menus/buttons were hard to find or they just didn't make a whole lot of sense? One of the biggest mistakes beginning webmasters often make is to put every single page on the website navigation menu. That might be OK in the early stages of website development, but once you have 20 or more buttons or links on your menu, chances are it's going to be overwhelmingly confusing for visitors to navigate your site. Keeping things simple, logical and organized is the key to designing website navigation that works! In the tutorials in this section of the site, I'll be going into much more detail about how to make web site menus that people can use, but here are some quick tips for creating effective web site navigation. Make sure your menu stands out on your webpage layout so it is easy and fast to find. Keep navigation in the same places and use the same styles from page to page. Be consistent! Label the links/buttons in your menus with clear & accurate names. Keep it short and simple! Avoid tons of buttons & links. Offer clues to the reader as to which page they are currently on. 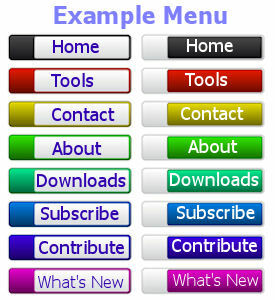 To get more specific tips, visit the tutorials below that relate to what you want to do with your web site navigation. Click on the description of the tutorials below to get specific tips and step-by-step directions for working with web site menus. How deep do you go with web site navigation? Where is the best place for a web menu to go? How should tier structure translate on a web site menu? 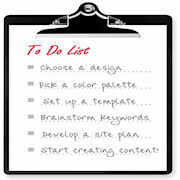 It's a good idea to take time for some real planning and vision when it comes to creating your website menus. Effective website navigation doesn't just happen... you must create it in a clear and logical manner!